I give you the F...B...I. The agents were born in different States, in different years and we can only assume that they went to the FBI Academy at different stages of their lives. On the other hand, the passports for these FBI agents had passport numbers in a sequence. A little detail that would only ad more questions to this case. From the Legal Attache Page of the FBI: Legal Attaché Offices. "Each office is established through mutual agreement with the host country and is situated in the U.S. embassy or consulate in that nation". "...International liaison and information sharing are conducted in accordance with Executive Orders, laws, treaties, Attorney General Guidelines, FBI policies, and interagency agreements". The US Embassy in Panama seems like it didn´t get the message that the documentation presented by their Legal Attache has no legality at all. It also has no authenticy under Panama or US Laws. A representative of the United States and its Embassy in Panama, in the name of the FBI investigated the death of Franklin Brewster in 2006. This is what the documentation presented by David Watley to Prosecutor Luis Martinez reads. "...through the assistance that the Government of Panama has requested from the FBI to analyze blood samples, body fluids, autopsy tissue and food and drink items found in Mr. Brewster´s office". "...a breakdown of the samples given to me and that were sent to the FBI Laboratory and now they are being returned to you." This is based under the Mutual Assistance Treaty between the governments of US and Panama signed by both Countries for these purposes. Therefore, the documents signed by their Legal Attache, which originated at the FBI Lab and in the name of the United States Government must be signed, sealed and delivered by the entity which represents this Government in Panama, the US Embassy. Any Panamanian petition has to go from the Mutual Assistance desk and the Office of International Affairs at the Ministerio Público in Panama to the US embassy. From there, to the US. Upon return, documents must be signed and stamped at the US Embassy and reverse the order for delivery, with each office signing for receiving the documents. At this point the original documents must be translated at the Public Ministry by a certified translator, stamped by him or her and signed. All Executive Orders, laws, treaties, Attorney General Guidelines, FBI policies, and interagency agreements were ignored by David Watley, the US Ambassador William Eaton and the FBI. None of this happened. The infamous "FBI lab report" went from David Watley to Prosecutor Luis Martínez via Fax. No originals. A translation was made from the fax page, totally illegal for a certified translator. They must translate documents with the originals. Straight on to the case file. Circumventing the law. The Legal Attache at the US Embassy knows this procedure. That´s his job, isn´t it? Reporter Adelita Coriat asked the US Embassy in Panama to authenticate the documents presented by their representative in Panama to dispel any doubts in this case regarding the authenticity of the documents and the identity of the alleged FBI agents involved in this matter. A simple and respectful petition: please authenticate the documents delivered by your Legal Attache in the name of the institution you represent by certifying that you have original of the documents presented to the government of Panama. Otherwise, the Laboratory report presented by the representative of the US Embassy in Panama was not done at the FBI and the document is a fake. As fake as the FBI credentials of one of the Federal Agents. As fake as the polygraph examinations done by their "polygraphists", who were in total violation of the code of ethics of any Polygraph Examiners Board. Not to mention breaking US and the Republic of Panama laws. After my request, I received an email from the US Embassy in Panama: "there would no further comments" and that I should refer to the last conversation I had with Mr. Gavin Sundwall whom I interviewed in June, 2008. In that interview, as I showed Mr. Sundwall the lab report, he did not answer a simple question: Is this an FBI document yes or no? There was no answer to a simple question regarding the authenticity of a Federal document in a criminal investigation. A murder investigation. I needed to know if the FBI issued this document. The US Embassy has not been able to confirm the source of this document and the FBI already informed me that they do not have any documentation on the Franklin Brewster case. By the manner in which these documents were presented, without any signatures, seals, received stamps or FBI stamps, without any guarantees that there are originals to these documents, lacking any procedural legal protocol as dictated by the Mutual Assistance Treaty and by the lack of answers from the US Embassy in Panama it is very probable that these documents came from the mind of a group of corrupt US Government employees and not from a scientific test as David Watley says. Another suspicious side to this is the polygraph exams which are not considered evidence anywhere on the planet. The Prosecutor´s Office under Luis Martinez accepted David Watley´s word as a bona fide scientific proof of guilt. The graphs from this examination have never been produced by David Watley. They are not in the case file. Only the verbal opinion of one of the examiners is mentioned in it. Article 2123 of the Panamanian Judiciary Code indicates that it is obligatory for this type of evidence to be part of the case file. The polygraphs, done by FBI agents Jay Cherry, Richard G Palacios and R. Blake MCConnell performed these exams in a hotel room after kidnapping two Panamanian citizens without any authorities present and without the benefit of legal counsel for the Panamanian agents. The results were not showed to the Panamanian detectives, therefore they didn´t sign them. The original graphs, according to the case file are in the FBI files FBI 163-PC-965 in the US. The Federal Government cannot back up David Watley´s story, documents, John Warner as a Federal law enforcement officer or the evidence he presented. The FBI toxicologist Madeline Montgomery cannot back him up either with a Toxicology Report with her name on it without a signature. 4.3.1.1 When the examinee is represented by an attorney who requests that no post-examination interview be conducted, and that the results of the examination be released only to the attorney. 4.3.1.2 When the examination is being conducted by court order which stipulates that no post-examination interview is to be conducted. 4.3.1.3 Instances of operational necessity. The FBI said they don´t have any documents at all. If the US Embassy in Panama has the polygraphs, they are not showing them now and they were not interested in due process then. At the time, they didn´t care if innocent people went to jail with this farse. The case file also does not show any interviews, electronic data, research, or any activity similar to that of a criminal investigation. There are no inquiries with the family, the search for other suspects or the persons who paid for the murder. No gumshoe work in a murder case. Jaime Jácome, ex Chief of the Judiciary Police commented "the FBI came to mess up an investigation that could´ve been done efficiently". David Watley was trained at the FBI, he knows the strict procedures to follow in a investigation of this kind. The prosecutor has stated in the past that he knows the Law in Panama and the General Attorney Ana Matilde Gomez publicly reafirms her position that she makes decisions based on due process. So we ask: How is it possible that none of them noticed this obvious irregularities? How is it possible that after making public these irregularities none of the institutions involved have come forward to correct them? If the US Embassy verifies that these documents are authentic, this would force the FBI to accept that the documents are real also. But they already documented that these documents don´t exist. Then we have to remind you that these documents do not have the signature of Madeline A. Montgomery, the Chemist who supposedly prepared this toxicology report with samples that arrived at the FBI laboratory with multiple IDs. This would also force the FBI to admit that the FBI agents who presented their credentials in Panama are indeed Federal Agents working for the FBI despite the fact that in the case file there is no documentation indicating who they are. Besides, we already know that at least one of the FBI men was a fraud. John Warner. A US Citizen presented himself to a friendly foreign government as an FBI agent with a fake FBI ID in a murder investigation and nothing has happened. All this while the US Ambassador , DEA agents and the Legal Attache of the US Embassy stood by playing along, lying to a host government. In July 2008, after two years in jail, agents Veliz and Brown were dismissed by Judge Luis Mario Carrasco. In his legal opinion, "the Prosecutor proved that there was a punishable offense but the evidence presented in the case was not enough to prove the guilt of the accused". That´s an understatement. There isn´t any evidence in that case file. A worthless, illegal piece of paper and the personal opinion of the Legal Attache that they were lying can hardly pass the Daubert test of scientific evidence in a murder case. Based on the Judge´s decision, the prosecutor in the case, James Bernard is analyzing the possibility of presenting additional evidence for a retrial. That would be a good one. On January 14th, 2010, Adelita Coriat asked the new US Ambassador in Panama Barbara Stephenson to authenticate the documents once more. The receiving person who signed for the documents at the US Embassy commented: "These documents don´t have any seals from the Embassy". Indeed they don´t. Adelita Coriat´s answer: Those are the documents presented by David Watley to the Panamanian authorities. As of February 12th 2010, the answer from the American Embassy is a refusal to produce or authenticate any documents related to the case and they advise the reporter to apply for a FOIA with the FBI. They can´t even respond a yes or no question when asked if the documents are authentic. The US Embassy in Panama already knew that the FBI did not honor a FOIA request and that prior to that, the FBI´s written response was that this document and the document number are not theirs. Yet, the US Embassy advises her to go and apply for a FOIA request. More lies and deceit from the US Ambassadors in Panama William Eaton and Barbara Stephenson in order to cover up a murder and the illegal activities of the persons under their administration. "With this, I invite the US Embassy, the same way I did with the FBI Director Robert Mueller though an email before making this information public to correct my observations of this report, which has as a goal to uncover the truth. I ask them to correct me if I´m making a mistake on any concept after I confirmed the legal details with attorneys in Panama and with International Law jurists. The Chief of the Sensitive Unit in Panama, the anti drug Unit is dead under suspicious circumstances and his body was cremated. Two detectives were incarcerated for two years and lost their jobs, their income and their reputation based on the opinions of an alleged FBI investigation and unheard of Forensic Evidence presented along with illegal procedures. No arrests have been made regarding this murder to this date. Omissions, irregularities and cover up of a murder. 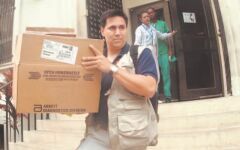 Documents presented by the representative of the FBI in Panama lacking any legality. Documents that would not be accepted in a US Court of Law. There has been no punishment to any of the parties involved. The criminal behavior on the part of the FBI, the DEA agents and other characters involved in this case could be associated with actions such as a fraud to the nation, falsifying evidence, impersonating a federal agent, obstruction of justice, conspiracy and even complicity in a murder." In mid January 2000, Luis Gomez Bustamante attended a meeting in Panama to discuss possible cooperation with the DEA. Bustamante revealed that a high-level DEA agent in Bogota was on the “payroll” of a corrupt Colombian National Police colonel named Danilo Gonzalez — who was eventually indicted by the U.S. Department of Justice on narco-trafficking charges... “A representative of the Department of Justice reviewed the allegations and found that the reporting agent [Fields] had been telling the truth…,” the Kent memo claims.